On August 2nd we kicked off our Farms, Forests, and Fisheries tour, by opening the schooner to the public at a new venue for us, the ECHO Center. It was interesting to see the Burlington waterfront from this new perspective. We have docked at Perkins Pier for seven years as our homeport location. This is just two docks to the south, on the old historic South Dock, aka the salt dock. It was different to be up near the boathouse and to be between all the commercial traffic of our friends the Lake Champlain Transportation Company, The Spirit of Ethan Allen III, the Whistling Man Schooner Company, and next to UVM’s research vessel, RV Melosira. 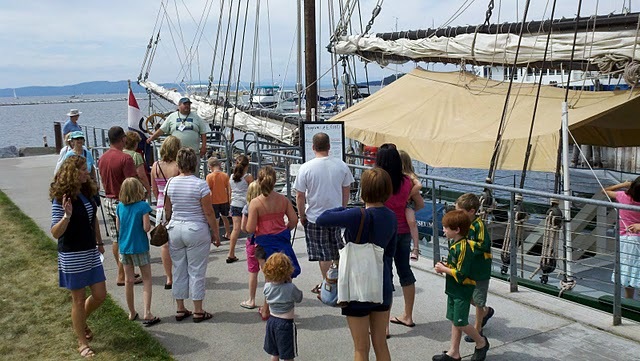 Although we weren’t as visible from the road as we are at Perkins Pier, the ECHO Center and the Burlington Boathouseprovided an amazing amount of foot traffic to our schooner. Daily over 250 visitors from all around the country and many international visitors came aboard, including three men in lederhosen! Thankfully our intrepid interpreter Ernie Haas was on board and he interpreted in German. We also welcomed aboard a group of visitors from ECHO at 2pm each afternoon for a special perspective on how “Shipwrecks Come Alive”. Between 25 and 50 visitors took advantage of this special introduction and tour every day. One very nice feature of this dock is that we were very well protected from the waves, which proved very useful as a nasty, windy, thunderstorm rolled through. Earlier this year at Perkins we had been hit by another blast of a storm and we were picking up pieces of our exhibit out of the lake afterwards. Thankfully the breakwater protects us from the worst of the weather in either location. All in all we had a great stay with our friends at ECHO, and look forward to partnering with them again in the future.